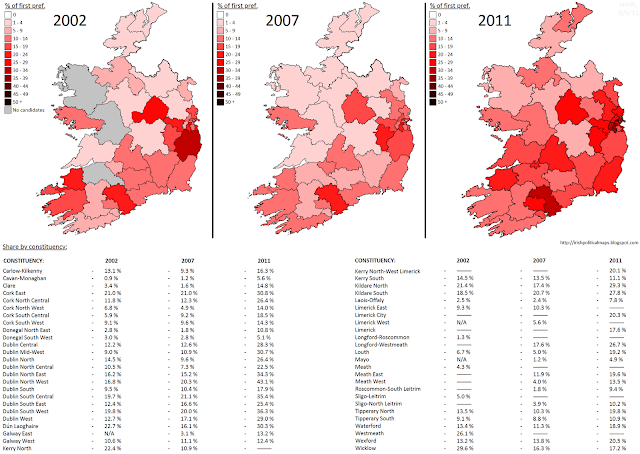 Constantly the "half" in Ireland's "two and a half" party system, the Labour Party enjoyed a period in government between 1992 and 1997, first with Fianna Fáil and then with Fine Gael and the Democratic Left in the so-called "Rainbow Coalition". The party suffered in the 1997 general election, eliminating most of the gains made in the "Spring Tide" of 1992. Blame for the loss fell on the party's decision in 1992 to go into government with Fianna Fáil, something the party had promised it would not do while campaigning. The party's prospects in 2002, therefore, were not dazzling and Labour went through the general election of that year with the loss of one seat and 2.1% of their vote. Ruairi Quinn stepped down as leader to be replaced by Pat Rabbitte, who in 2007 teamed up with Enda Kenny to form a transfer pact with Fine Gael. This "Mullingar Accord" backfired terribly on the Labour Party however - while Fine Gael did very well and gained back their 2002 losses, Labour did not receive enough first preferences and consequently lost another seat. Another election defeat meant another leader, and Eamon Gilmore took over the party later that year. He quickly established himself as a popular political leader, and with the nosedive in the popularity of the government parties, Labour looked set to benefit under Gilmore. Late 2010 saw the prospect of a Labour-led government look plausible, so much so that when the general election was called in early 2011, "Gilmore for Taoiseach" became a Labour slogan. However, the party appeared to have peaked too early, and and as the election drew nearer, their poll numbers declined in favour of Fine Gael. Nonetheless, the 2011 general election produced Labour's best ever result, with 37 seats and 19.4% of the overall first preference vote. For the first time since 1927, Labour were the second largest party in the Dáil. Whether they'll remain as such or go back to being the "half" is yet to be seen. For people affected by colour-blindness, a greyscale version of this map is available here.